Not to be confused with Banco Espírito Santo, founded in 1920 in Portugal. The Bank of the Holy Spirit (Italian: Il Banco di Santo Spirito) was a bank founded by Pope Paul V on December 13, 1605. The Bank was the first national bank in Europe (as the bank of the Papal States), the first public deposit bank in Rome, and the oldest continuously-operating bank in Rome until its merger in 1992. 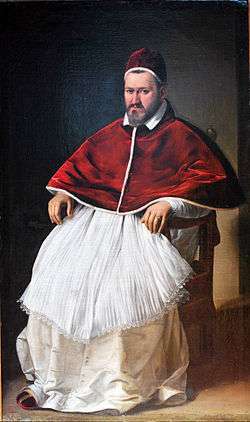 Pope Paul V founded the Bank in 1605. The Bank was founded by Pope Paul V in the Bench of S. Spirit building (which became known as the Palazzo del Banco di S. Spirito) on December 13, 1605. The construction of the building was started in 1513 by Pope Leo X, on what became known as the "Street of the Banks." The newly founded bank provided a new source of income for the Archhospital of Santo Spirito (founded 1201), whose financial difficulties had been increasing throughout the 16th century, and in 1607 the bank began supervising the finances of the hospital, which owned the bank. From February 20, 1606 to 1923, the Bank of the Holy Spirit provided capital for churches and hospitals constructed in Rome, and other commercial purposes. The bank lent funds to several public works projects, including the Trajan aqueduct project (begun 1608). In 1750, Pope Benedict XIV, known for his condemnation of usury: Vix pervenit (promulgated November 1, 1745), reorganized the Bank and restricted its lending activities. In 1786, the bank became one of the first to issue paper money during the pontificate of Pope Pius VI. The records of the Bank are extant in the Vatican Secret Archives, but not in Introitus et Exitus, the records of the Apostolic Camera. In 1923, the Bank was reorganized as a joint-stock company. In 1935, the Istituto per la Ricostruzione Industriale (IRI) of the fascist Italian government gained a controlling interest in the bank. In the 1930s, Neapolitan bank robbers attempting to dig into the underground vaults of the Bank accidentally discovered the skeletons of victims of an 1836 cholera epidemic, which after archeological excavation became known as the Fontanelle cemetery. In 1992, the Bank of the Holy Spirit—which had previously merged with the Cassa di Risparmio di Roma (est. 1836) in 1989— merged with the Banco di Roma (est. 1880) to form the Banca di Roma, which subsequently merged with other banks in 2002 to form Capitalia. ↑ Euvino, Gabrielle. 2001. The Complete Idiot's Guide to Italian History and Culture. Alpha Books. ISBN 0-02-864234-1. p. 106. 1 2 Freiberg, Jack. 1991. "Paul V, Alexander VII, and a Fountain by Nicolò Cordier Rediscovered." The Burlington Magazine 133 (1065): 833–843. ↑ Fodor's Online Travel Guide. 2007. "Touring Old Rome." ↑ (Italian) Piperno, Roberto. "SS. Celso and Giuliano." ↑ Copetas, A. Craig. 1997, April 18. "Travel: Guide Is Key to Italy's Ancient Banks --- `Forma Urbis' Unearths Many Unusual Gems." The Wall Street Journal. 1 2 Cohen, M. 1994. "Capitalia S.p.A." International Directory of Company Histories 65. ↑ Snodgrass, Mary Ellen. 2003. Coins and Currency: An Historical Encyclopedia. McFarland & Co., Inc. Publishing. ISBN 0-7864-1450-2. p. 317. ↑ Ambrosini, Maria Luisa, and Willis, Mary. 1996. The Secret Archives of the Vatican. Barnes & Noble Publishing. ISBN 0-7607-0125-3. p. 136. ↑ Herling, Gustaw. Trans. Bill Johnston. 2006. The Noonday Cemetery and Other Storie. New Directions Publishing. ISBN 0-8112-1529-6. ↑ Who's Who in Italy. "Banca di Roma."